At each annual Conference since 1968, the Board of Directors has honored a member of the profession for distinguished service and leadership. Since 1978 the award has been given in honor of Nelson H. Brooks. Sr. Mary Helen Kashuba, SSJ, DLM has devoted almost 60 years to the teaching and promotion of world languages. Currently in her 56th year of teaching post-secondary French and Russian at Chestnut Hill College, she has served on state, regional, and national boards such as ACTFL, AATF, NECTFL, PSMLA, MLAPV, and ATSEEL. 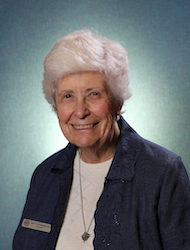 Sr. Mary Helen has served on many committees, organized local, regional and national conferences and has presented at conferences around the world. She has received state and national teaching and leadership awards, including Officier in the Palmes Académiques. Sister Mary Helen was the recipient of a Fulbright Research Grant and, along with additional grants, led the development of new academic programs, teacher exchange programs to Russia, and professional training for world language teachers. Author of over 50 articles, Sister Mary Helen’s experience, work ethic, intelligence, calm demeanor, and unbridled passion for world languages have made her an exemplary leader, mentor, and colleague. 2011: Gregory Duncan, InterPrep, Inc.